JaiZBlog: Google Talk Dialpad PC to Phone VOIP to Challenge SkypeOut? Google Talk Dialpad PC to Phone VOIP to Challenge SkypeOut? 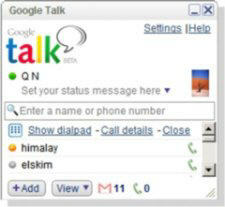 Google appears to be about to take on Skype and other VoIP services with the addition of a dialpad to Google Talk. Members of the Google Blogoscoped forums found this image and some basic information on the new application from an internal Google apps resources overview [which has now been taken down]. The new addition would ideally let users dial landlines and cell phones using Google Talk, which is now limited to dialing out only to other users who have Google Talk or compatible VoIP solutions. eBay’s Skype of course has the ability to dial from PC to phone using VoIP technology, and Skype brings in a hefty amount of revenue via the SkypeOut program, where users purchase minutes via eBay’s PayPal. If Google Talk does charge for external phone calls, expect Google to offer cheaper rates than Skype if Google Talk users pay with Google Checkout, Google’s online payment system program. Comparitively, Google Checkout offers discounts for merchants and buyers who use the system for a purchase. One other option would be free PC to phone outbound calls paid for by serving contextually targeted advertisements via Google Talk in the same manner as GMail based upon voice recognition, but of course doing so would set off all sorts of red flags. Since the Google Talk Dialpad seems to have been tested in Google Apps, which are built for user personalized homepages, perhaps their is some way that Google could spin targeted advertising into the equation to supplement calling fees.